Mr Gujji Muthuswamy is an Industry Fellow in the Faculty of Business and Economics, Monash University and lectures on carbon pricing. Gujji has more than 30 years experience in the electricity industry, mainly in Australia but including Hong Kong and the USA, working in energy trading risk management, retail and distribution pricing, strategic and business planning, load research, demand management and research project management. He has worked in the industry before, during and after the major competition and privatisation reforms of the mid-1990s, both in energy utilities and as a consultant. He recently retired from the State Electricity Commission of Victoria after eight years on its Board during which time he held the roles of General Manager, Deputy Administrator and Member of the Executive and Audit Committees at different periods. 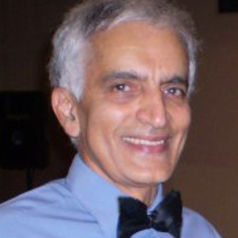 Gujji’s interest in emissions trading started in the mid-1990s and he invented and patented in 1999 a board game dealing with greenhouse gases emissions trading. He has made submissions to the Prime Minister’s Task Group on Emissions Trading in 2007 and submitted a paper “Multi Sector Carbon Trading” to the Garnaut Review in 2008. Prior to joining the electricity industry, Gujji worked for 9 years with BHP Ltd in its Steel Division and for six years in the automotive industry in the UK and India. He holds a B.E in Mechanical Engineering from Madras University, India, M.Sc from Cranfield, UK and MBA from the University of NSW.